In 1977 Voyager II was launched into space, on it's surface was a plaque and a message inviting all lifeforms in the universe to visit our planet. So, if an extraterrestrial found the message and decided to visit, what would be the result? When an extraterrestrial arrives on Earth in a non-corporeal form, it uses the DNA from a saved lock of a dead man's hair to develop a human body. Jenny Hayden (Karen Allen) wakes to find her dead husband apparently alive and naked in their lonely cabin. 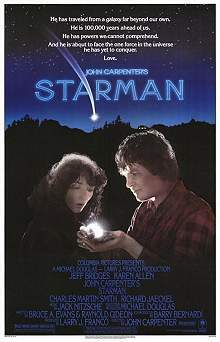 The Starman (Jeff Bridges) says, "Please ... help", and he has a gun, so Jenny drives him to Arizona encountering less than stellar people on the way, giving him a chance to experience human nature. During their trip the starman gradually becomes more at home in his new body. His speech patterns become more normal, his body language is closer to human. Bridges does a nice job of being a stranger to a human body. He and Jenny develop a level of trust, and then love in their journey across the country. But starman's arrival has not been unnoticed and the powers that be call out the forces as well as the scientists to contain this possible threat. We invited him ... what about good manners? Starman asks a familiar question, but one that remains pertinent: what would the forces in power do if confronted with strangers from elsewhere? What would we do?